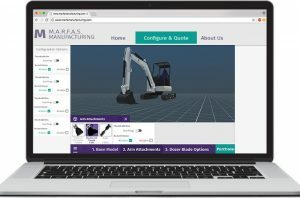 CHARLESTON, S.C., June 5, 2018 /PRNewswire/ — Atlatl Software, a leading provider of 3D and augmented reality configuration software for manufacturers and Silver level member of Oracle PartnerNetwork (OPN), today announced a collaboration with Oracle Configure, Price, Quote (CPQ) Cloud, part of the Oracle Customer Experience (CX) Cloud Suite. Atlatl’s product offerings simplify the manufacturing sales process through rules-based engineering software and visual configuration of manufacturing product offerings. “We’re excited to work with Atlatl to offer our customers integrated 3D and augmented reality configuration with Oracle CPQ Cloud. Our collaboration allows our customers to deliver a compelling visual configuration experience with game-changing augmented reality,” said Christopher Shutts, vice president CPQ cloud development at Oracle. “Working with Oracle CPQ Cloud is an exciting step for Atlatl. Our product offerings complement Oracle’s already robust software to provide customers with one of the most comprehensive sales enablement solutions currently on the market,” said Susan Burris, vice president of enterprise at Atlatl Software. Atlatl has been mentioned in Inc.com, G2Crowd, and Gartner solidifying their place among Visual, 3D and Augmented Reality Configurator industry giants. Being a new, growing company listed alongside mature, established vendors is an incredible opportunity and solidifies Atlatl’s offering as industry leading. “The recent attention Atlatl has garnered is both validating and motivating. The visual shift in the B2B market is coinciding with the advent of new technology, like Atlatl’s,” added Marc Murphy, CEO of Atlatl Software. Oracle CPQ Cloud is part of the Oracle CX Cloud Suite, which empowers organizations to take a smarter approach to customer experience management and business transformation initiatives. By providing a trusted business platform that connects data, experiences, and outcomes, Oracle CX Cloud Suite helps customers reduce IT complexity, deliver innovative customer experiences and achieve predictable and tangible business results. Our Enterprise Platform and QuoteBooks Cloud product suite empower the highest performing manufacturers to sell faster, more efficiently and increase revenue across their whole sales channel. Atlatl’s customers leverage 3D Visual CPQ and CRM functionality to configure complex products and empower distributed sales channels.